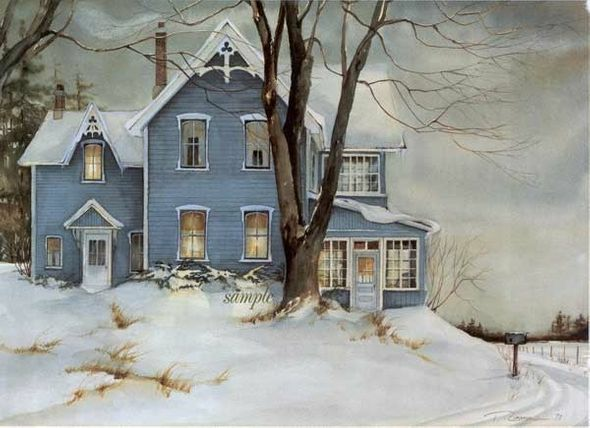 Trisha Romance Hand Signed and Numbered Limited Edition Giclee:"Dusk"
Image Size: 17.25" x 23.25"
Artist Statement: The white gable of this house attracted me like a snowcapped mountain. It was the first gingerbread fretwork I had ever seen that had a prominent shamrock in it's design. Since carpenters were often given the freedom to create finishing details as they wished, I wondered if this one had been a carpenter with a little bit of leprechaun in him. Trisha's Life as an artist began at a very early age. The drive to capture her immediate surroundings and find inspiration in everyday events of life can be traced to when she was only five years old. This vision and excitement for life continues to be the creative force behind her celebrated work today.